Kenny has embraced two new habits, one an endearing heart-tugger, and one heart-tuggingly hysterical. 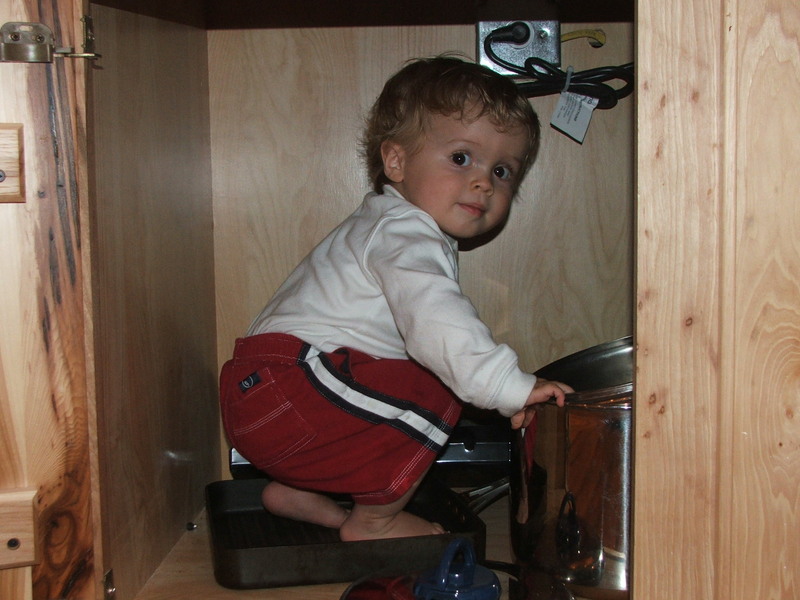 Ok, climbing into the cabinet underneath the stovetop to play drums on the pots and pans isn’t one of them, but it’s pretty darn cute, wouldn’t you say?? I have to say, it fills me with this tingly kind of joy, knowing that whether he understands it yet or not, he does know that praying is a normal and happy part of our day. Just like he likes me to sing “Jesus Loves Me” and “Row, Row, Row Your Boat” and “How Great Thou Art” and “The Itsy Bitsy Spider” all in a row. And I love that. I love that God is part of his life already. “Mama? Dudley? Duuuuuuuuudley? DUDEE! Dudley?” I was collapsed in a heap of laughter outside his door. Like Dudley is going to gallop in there to his rescue, right? Then he kicked it up a notch: “Dink? Diiiink? Dink! Dink?” Here’s the kicker: “Dink” is the foreman on our renovation job. He’s been at our house everyday, nearly all day, since before Thanksgiving. Kenny really loves this guy, for some reason. In fact, in the morning, right after he’s gotten a chunk of banana in each fist, he waddles over to the renovation area and starts looking around, calling, “Dink? Dink?” But little did I know that he was going to start calling on Dink to spring him from an undesired nap. I just happened onto your blog… I love reading it… It\’s amazing what kids do. Merry Christmas!